I’m not a fancy eater, but I’ve had my fair share of fine dining to know what to expect on a dinner menu. And even with that knowledge, deciding on the dish is still a fierce battle. Great chefs always have that finishing touch that defines the aftertaste of their food. Many times, what linger at my taste bud are not necessarily the meat, but the garnish, condiments, sauce and sides (and it’s not a bad thing, because you can grill that cut at that temperature for that long, but one distinctive addition and your food will turn to a whole new direction). 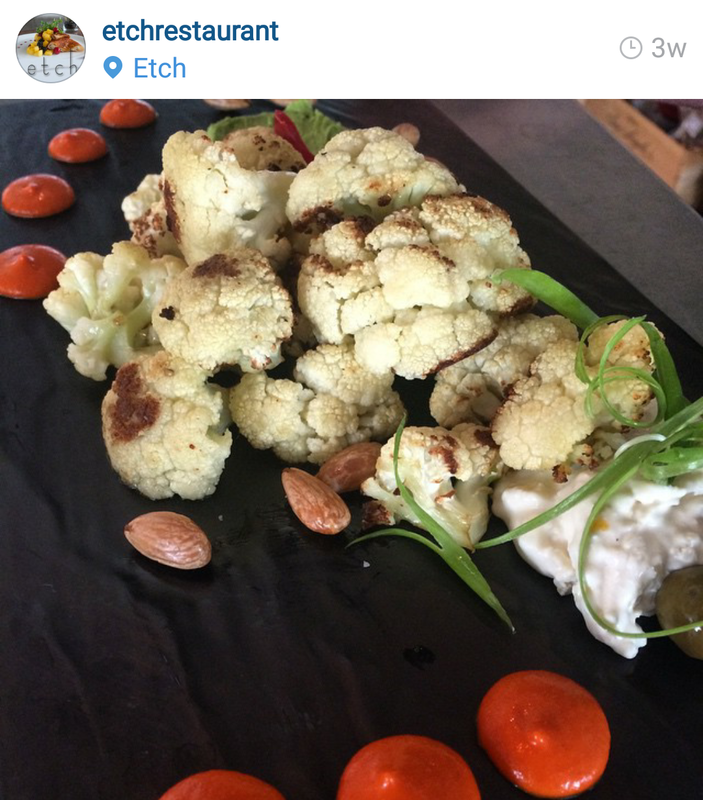 Etch is a young and prospering addition to the food scene in Nashville. Exhibit A: it will appear in most “top restaurant” lists you find on Google. Exhibit B: even the bar seating was full, and we went on a weekday. Exhibit C: it donates $1 to the local food bank for every sale of the signature appetizer – roasted cauliflower with truffled pea pesto, salted almonds and feta dip. In 2014, $22,012 was raised. With Saturday dinners only and Sundays closed, that’s 76.69 dishes served per day (#ididthemath). As first-time eaters, we ordered the popular: the roasted cauliflower (why not eat good and do good both), butter tasting (came in 4 ramekins, the butter stayed loyal to its creamy texture, but each contained a unique twist). Then a strange name caught my attention: Cobia. In a moment of pretentiousness, I stealthily looked it up online. Turn out, just like Nashville, it is also one of the up-and-comings. Other names include black salmon, black kingfish, sergeant fish, and – prodigal son! Those extravagant names might have something to do with its sizes – an average cobia is huge and often mistaken for sharks. Most cobias are farmed and under management, so it’s sustainable. It’s delicious, so it makes a nice alternative white meat. Cobia has been making it ways to several lauded restaurants, but only a few keeps it on as a regular (check out The Gramercy Tavern if you’re in NYC). Even fewer has managed to make a big hit like Etch. Let me start about the fish itself. In the words of my friend who took a bite of my plate, “it taste[s] like tofu”. Granted, he was not totally wrong. The texture did resemble that of medium firm tofu, but denser and more luscious. The challenge with fish, I find, is that it could easily taste bland and dry. Pan-searing, thus, helped contain the flavor and moist. The Turkish spices brought out the sweetness of the white meat. Admittedly, I didn’t know what exactly was in that spice mixes, but they weren’t too bold. Citrus fruits are commonly used with seafood, but here, brown-buttered oranges were more than just a garnish – it was a featured component. The sourness was prevailing, but relieved by the generous portions of raisins and almonds. And then there were capers and olives, each a little salty and bitter. It was an almost-perfect blend, except that the orange sauce was sourer than my taste bud could take. And I think that was when the most interesting attribute came into the picture: the beignet. I think it was made chewy on purpose, because when I dipped it in the orange sauce, it got not only softer, but also lessened the sauce’s immensely tangy citrus flavor. With the big pastry and extra sauce, I had the happy ending that every culinary tale needs. So, if you are ever in Nashville, stuff yourself with a Southern feast, wander around food trucks, or challenge your tummy with the hot chickens, but consider other eclectic restaurants like Etch. It isn’t widely considered a food city for no reason. 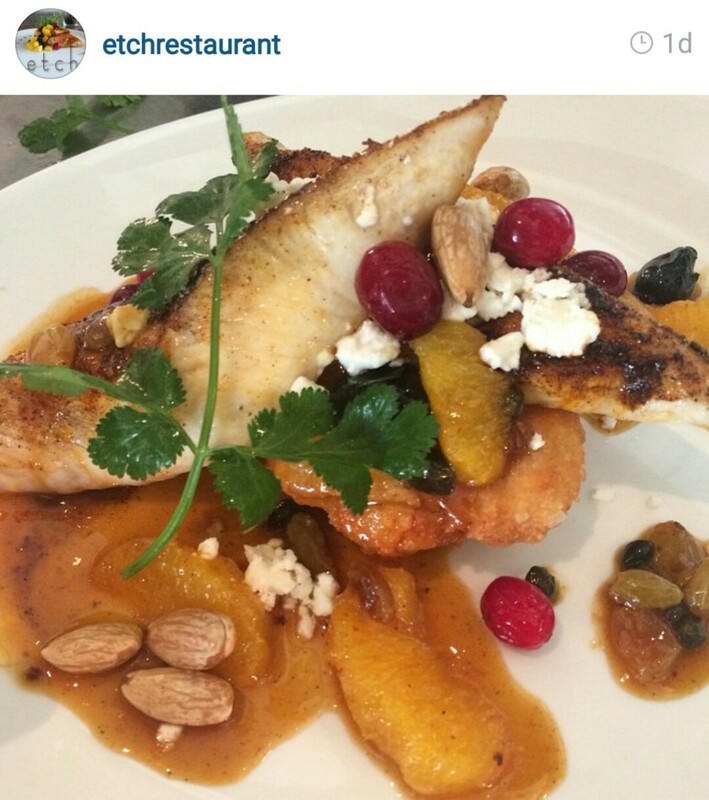 Photo credits: Etch Restaurant’s instagram. I’m refraining from taking pictures of food out of respect for the chef.